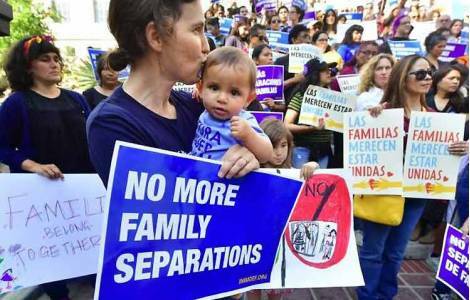 Washington (Agenzia Fides) - "While we truly want a legislative solution for Dreamers, we cannot, in good faith, endorse large structural changes to the immigration system that detrimentally impact families and the vulnerable, such as those that are contained in this legislation. We welcome the opportunity to dialogue with lawmakers and to discuss possible opportunities for further compromise, particularly with respect to effects on families and the vulnerable". This is what Mgr. Joe S. Vásquez, Bishop of Austin, Texas, Chairman of the U.S. Conference of Catholic Bishops' (USCCB/COM) Committee on Migration wrote in a letter sent a letter to every Member of the U.S. House of Representatives in response to two immigration bills that are expected to be taken up later this week by the full House. The so-called "Dreamers" are about 800,000 immigrants. President Barack Obama had introduced the Daca program (Deferred Action for Childhood Arrivals) as a stopgap measure that would shield from deportation people who were brought into the United States as children, a program suspended by the Trump administration. Mgr. Vasquez had previously written in opposition to the first of the two bills (H.R. 4760), introduced in January of this year, also under discussion this week, which provides for the reduction of visas for workers in the agricultural sector, the reduction of visas for family reunification, the funding to build a border wall with Mexico and the increase of agents employed in the Security Department. In his letter yesterday, sent to Agenzia Fides, Mgr. Vásquez states: "My brother Bishops and I appreciate the effort by Representatives to find a legislative solution for Dreamers by bringing immigration measures before the House of Representatives. We believe that any such legislation must be bipartisan, provide Dreamers with a path to citizenship, be pro-family, protect the vulnerable and be respectful of human dignity with regard to border security and enforcement".